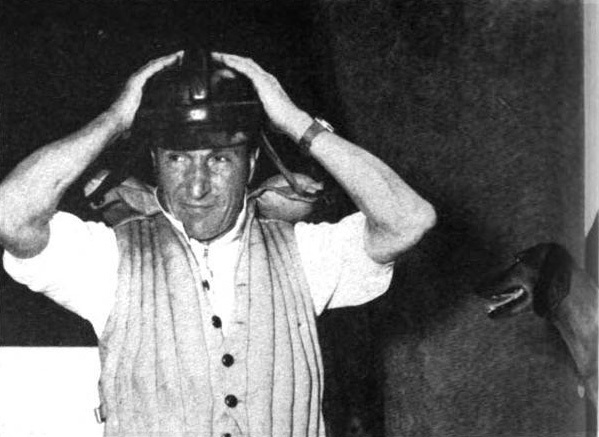 Italian Speedboat Star to Compete in U. S.
Achille Castoldi adjusts his crash helmet before starting on an early morning trial with Sant' Ambrogio II. Jo'-Jo', the pet dachshund, hopes for an invitation to go along. Sant' Ambrogio II, the most powerful speedboat in Europe, reported to have done 124 mph in a test run. Achille Castoldi, the top-flight Italian and European speedboat are, is completing preparations for his forthcoming tour of the United States, where he will take part with his Sant' Ambrogio II in some of the most important competitions. Castoldi intended to compete in the Gold Cup race and in the Detroit Marathon, but two unfortunate incidents damaged the powerful boat to such an extent that participation became impossible. Castoldi now claims that he is fully determined to make up for his bad luck in future races. American motor-boat competitions are surrounded in Italy by an atmosphere of legend. Races based on the free formula, that is without power limitations, cannot practically be held in Europe unless Americans are participating, as Castoldi is the only European racer who possesses a modern, really powerful boat. A second one is reported to be under construction in England for Sir Malcolm Campbell's son. Castoldi is the proud owner of a boat smaller than Sant' Ambrogio and belonging to the class under 450 kilos. This comparatively tiny boat however has 300 h.p. and a speed of up to 85 miles; it has a 1500 cc. motor which is the same with which the famous Alfa Romeo Alfetta cars are equipped. The boat has been named Arno II, the same engine mounted on a thinner, lighter boat covered the mile at an average speed of over 94 miles, thus establishing the world record for the class under 450 kg. Sant' Ambrogio however is the boat that should interest American experts and fans for its exceptional features. It has an Alfa Romeo D.B. aircraft engine of the 12-cylinder, 34 liters type, and is closely similar to Sant' Ambrogio I with which Castoldi took part in the 1948 Gold Cup race. It weighs 2.8 metric tons without passengers, gas or oil and its tanks hold 1.4 tons of gas. The engine's power is 1,800 H.P., and although Castoldi is extremely uncommunicative on the matter it is understood that Sant' Ambrogio II exceeded, 120 m.p.h. in trial runs. It has been entered so far, in only a single competition, the Coppa dell'Alleanza on Lake Garda, and won without meeting real opposition. Castoldi was testing Sant' Ambrogio last May at Milan's artificial seaplane base when the shaft where the two coaxial propellers are fixed suddenly broke loose. The boat, then reportedly running at over 124 m.p.h. swerved sharply and overturned. Castoldi remained under water, but luckily did not faint and after a short while he was seen swimming near the overturned boat. Within a week he was well again, but when he resumed training in preparation for the Detroit marathon, Sant'Ambrogio II was found to be out of balance and unable to speed with the required stability, one of its peculiar features. Now the hull has been rebuilt at record-breaking speed and Castoldi is confident he can test it in time for American competition next season. He is a sincere admirer of Guy Lombardo, Dan Arena and Foster and is eager to battle it out with the top American stars and boats. Castoldi is an exceptional sportsman, and his friends claim he would rather give up his industrial activity than his sport. He is the owner of a textile concern and the president of a maritime recovery society that recently salvaged the largest Italian liner Conte Grande. He has a degree of chemical science and one of natural science. But the 45-year-old industrialist and scientist is first of all a sportsman. At 21 he was a university world champion of sculling, practised motorcycling, track events, aviation and fencing, and is still a good golf player. But he loves motor boating and reserves all his free hours for his favorite sport. He hopes to go to America and is determined next year to enter all important American competitions. This is one of Castoldi's two major objectives, the other being the world record held by the late Sir Malcolm Campbell. The Italian ace has reasonable hopes that he can establish the new record before long.